Soon after the earthquake and tsunami hit Japan on March 11 my daughter Lily and her school friends started to make origami paper cranes. Urged on by a philanthropic challenge, they taught themselves (thank you YouTube!) how to make these beautiful shapes out of colorful paper. Our family got on board too. Lily taught all of us the steps and we had an origami night to add on to her class contribution. Lily’s class has to date made at least 1000 cranes! It was touching to see the dedication they brought to this project to send support and caring across the ocean. At the same time 8 Limbs Designer Kirsti Rochon started working on new t-shirt designs and by chance she made one with a paper crane illustration. We decided to go with this design and donate a portion of the sales from this limited edition shirt to benefit the Japan Relief Fund through Global Giving. 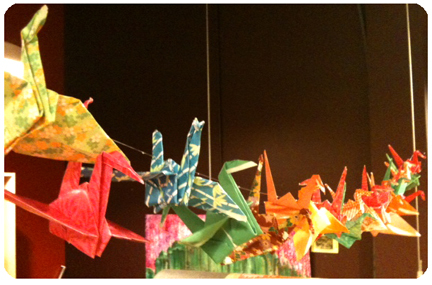 Thanks to Lily and her classmates for the idea and for the beautiful cranes we are using on our display. 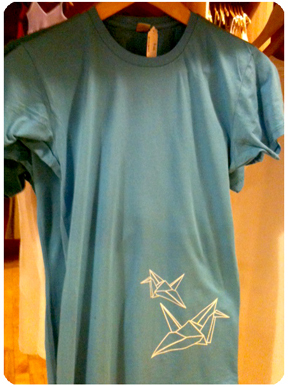 Come get yourself a summery turquise short sleeved Paper Crane tshirt while supplies last!